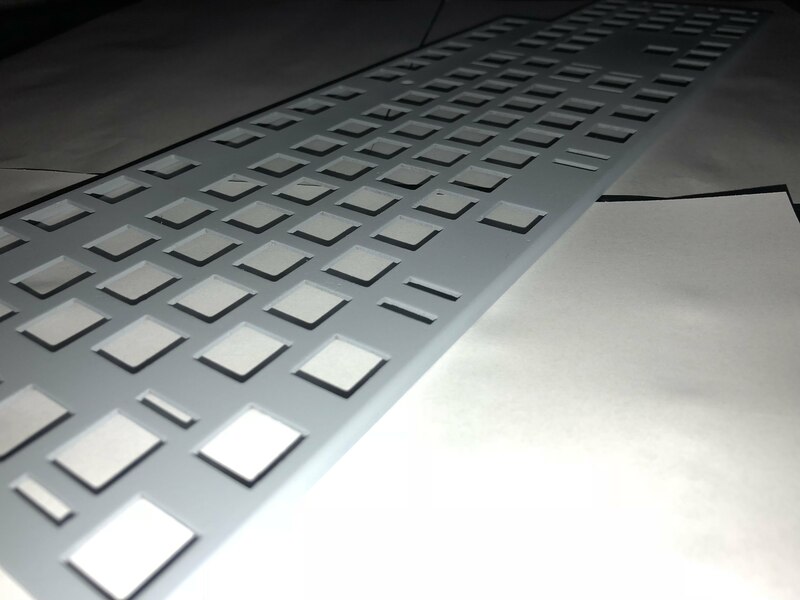 With the GH60 plates now complete and the GB coming to a close (hopefully), I'm toying with the idea of painting some, or all of the plates. They are made from stainless steel, non-coated and I was wondering what tips you might have on how to go about painting them? Stainless resists primers like other materials such as aluminum and other odd metals. I bet Melvang has the best advice. Otherwise, clean very well, and use Rustoleum. Many very light coats, and follow the directions to the letter. 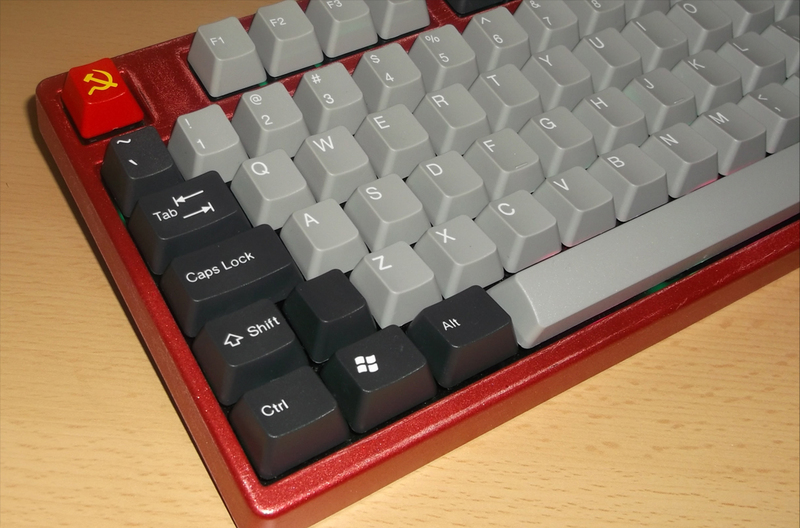 It's something that I've been debating about, because I do like the look of steel, but I have KBT Pure with WYSE key cap set that I want to add a plate to and I think a dark blue color would offset nice since the plate would be flush with the case. The case is the low-profile Vortex aluminum case that came with the Pure LE in 2012. You can see an example of what I'm talking about here. 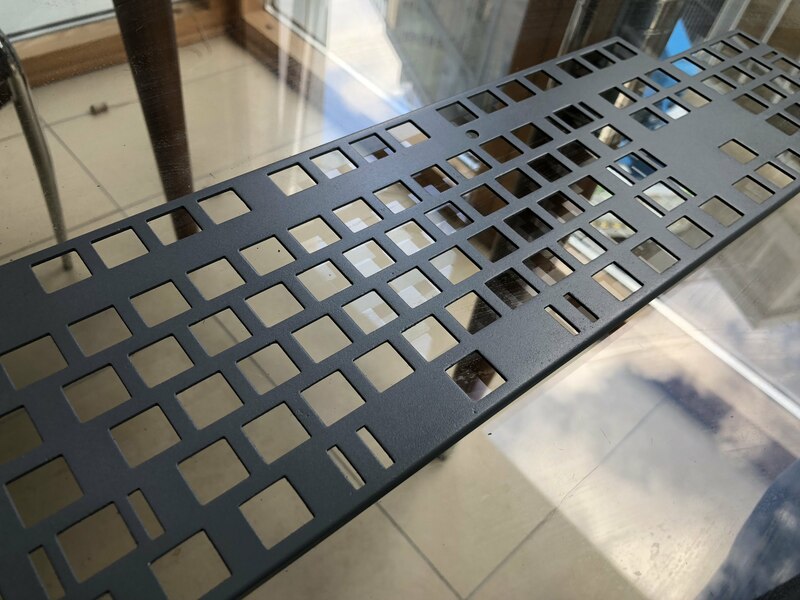 In those pictures, he has an anodized silver IMSTO universal 60%. 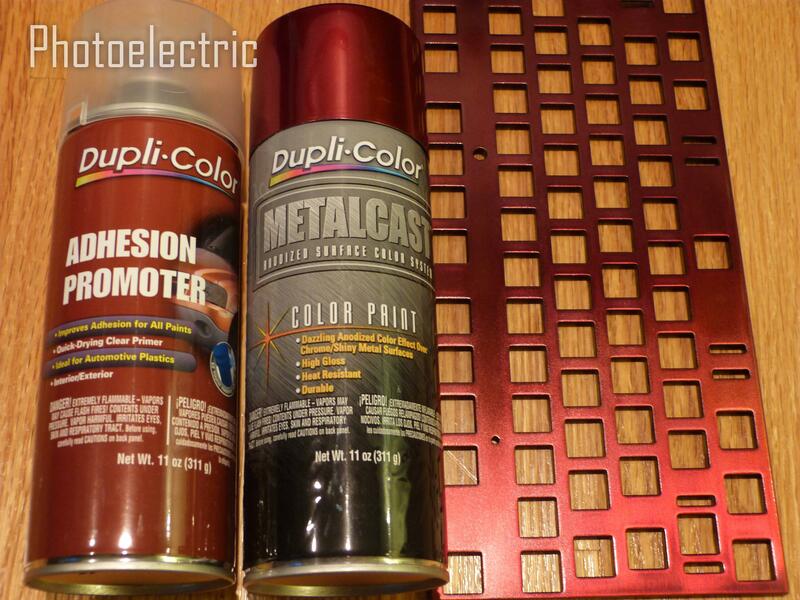 For metal, I've used Duplicolor's Adhesion Promoter (link to post), after reading about painting bare metal. 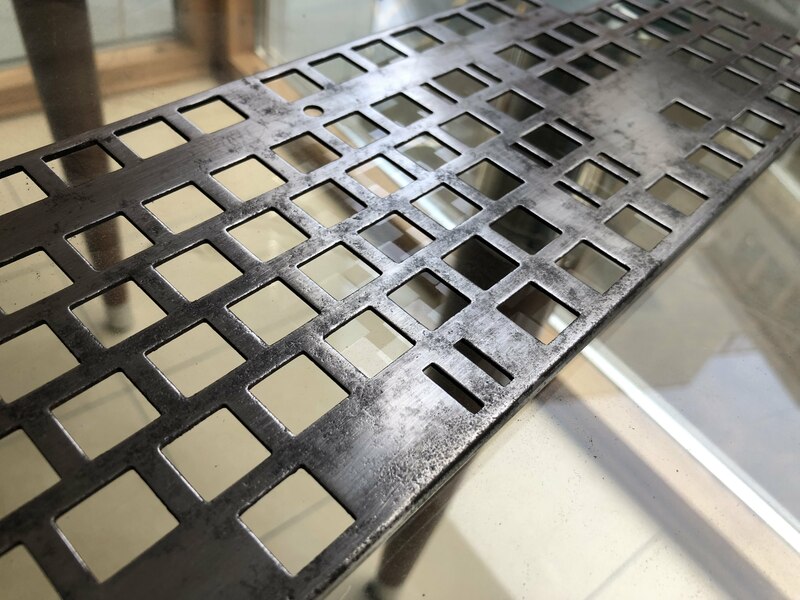 It goes on clear in a fine mist, and you can use translucent paint on your plate afterwards (or regular paint)--it's the primer recommended for their MetalCast line, but you can use it with other oil paints just as well (including by RustOleum). 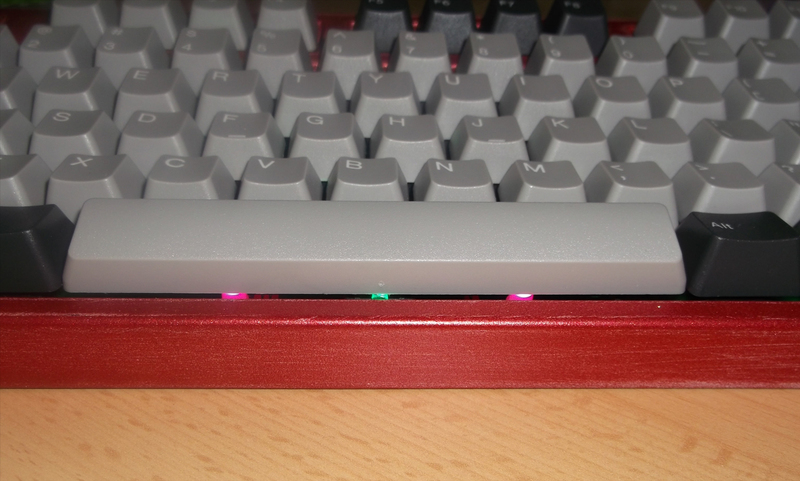 I've painted a sanded Filco plate (steel) with Duplicolor's translucent red color and that primer underneath, and the result was very hard and scratch proof. That primer is my general favorite to use in general now, because it goes on thinly, evenly, and is basically invisible. @photoelectric -- Thank you. As always, you are a fountain of information. Just keep in mind that painted surfaces will need more care when cleaning them. I.e. don't use swabs dipped in alcohol, for example. Anything that could be a paint thinner. I used gentle surface / glass cleaners for my painted surfaces, followed by buffing with a flannel cloth or similar. 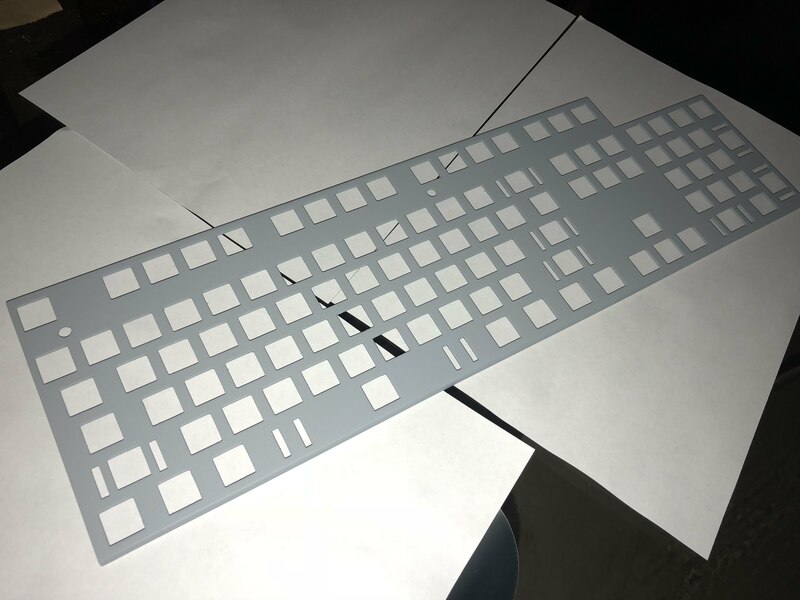 i recently got a filco tkl which is currently stock and was planning on painting it a glossy white using rustoleum ultra cover 2x gloss spray. as this will be my first time, i want to be very thorough with the process. 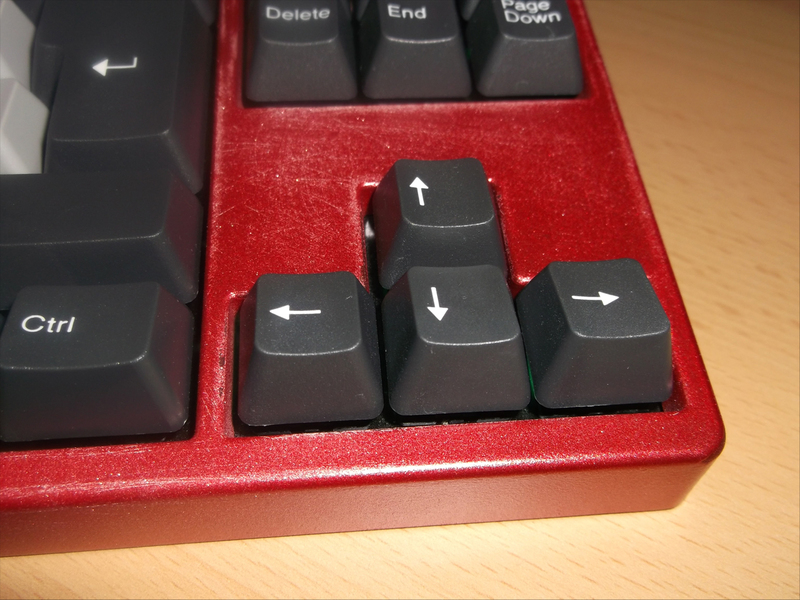 ive read through your keyboard painting tips and have made a rough plan on what im going to do, so please correct me if im missing a step, one of them is needlessly redundant, or one of them are incorrect. 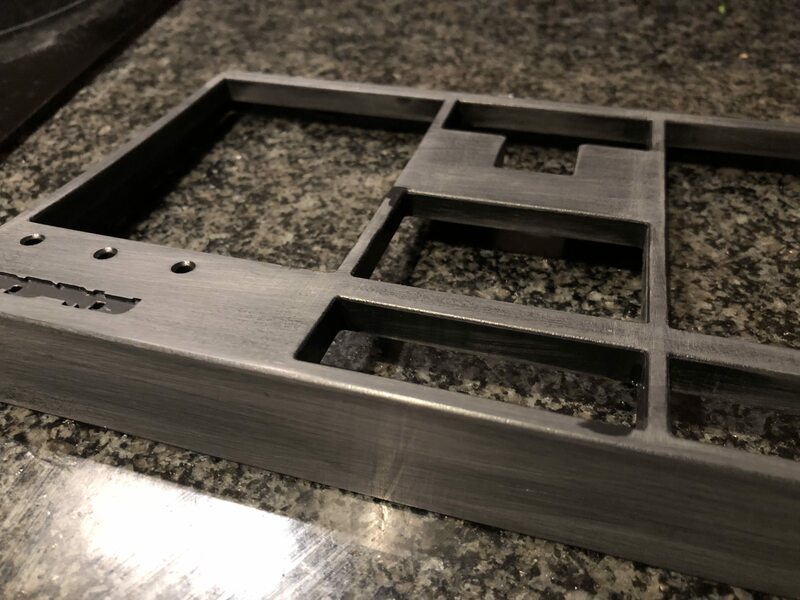 do i need water when i sand for the first step? in one of your posts, you said that my paint has a primer already, so i dont need an adhesion promoter; however, as i want this to last a long time, will the adhesion promoter help the longevity of my paint or will it be redundant? also, the reason i plan to use this one is because i saw in your past posts that you use it on mostly everything; however, there is a rustoleum ultra cover 2x primer spray from the ultra cover 2x line which comes in white (http://www.rustoleum.com/product-catalog/consumer-brands/painters-touch-ultra-cover-2x/primer). should i use that or stick with the dupli-color, if i use it at all? are my intervals between coats good? since the paint will add thickness to the case and potentially cause the case not to fit, do i have to cover the insides with painters tape? if not do i paint the insides as evenly/well as the outside? wet-sand with 800 or 1000 grit. 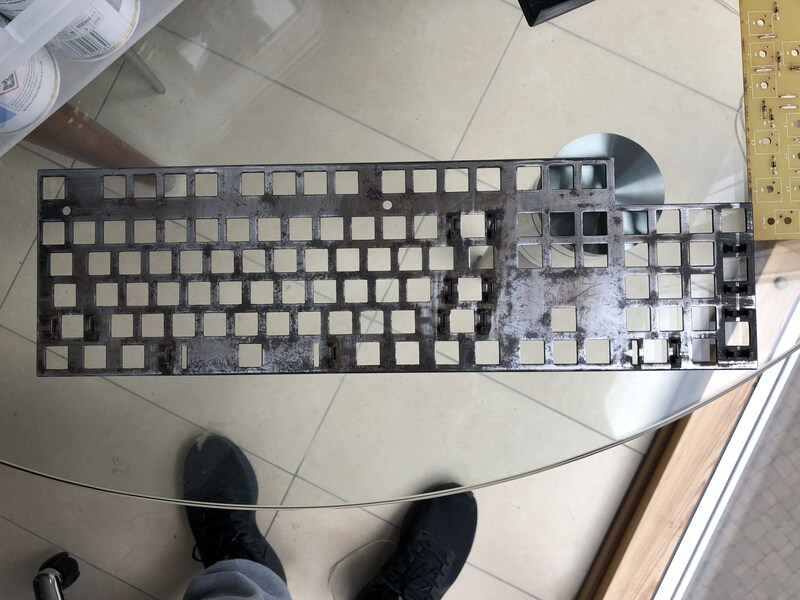 You just need to scuff that Filco cover a bit--200-grit was just for removing the rubber coating on QFR covers. Rinse and dry very thoroughly. Wipe with a microfiber cloth or anything that can remove as much dust and lint as possible. 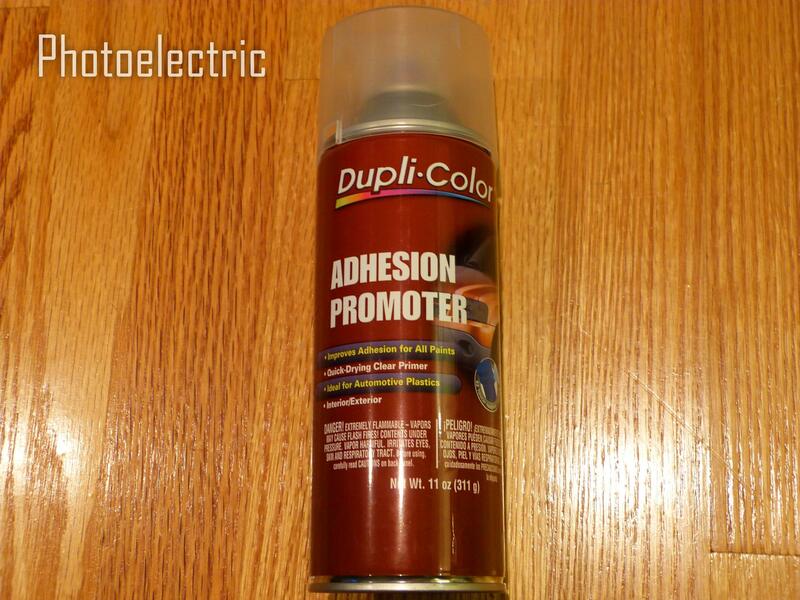 lightly spray dupli-color adhesion promoter with 1 light coat. You need to use the base paint within 5 minutes of spraying the adhesion promoter, as per instructions--I usually only wait a minute or two--it dries extremely quickly. 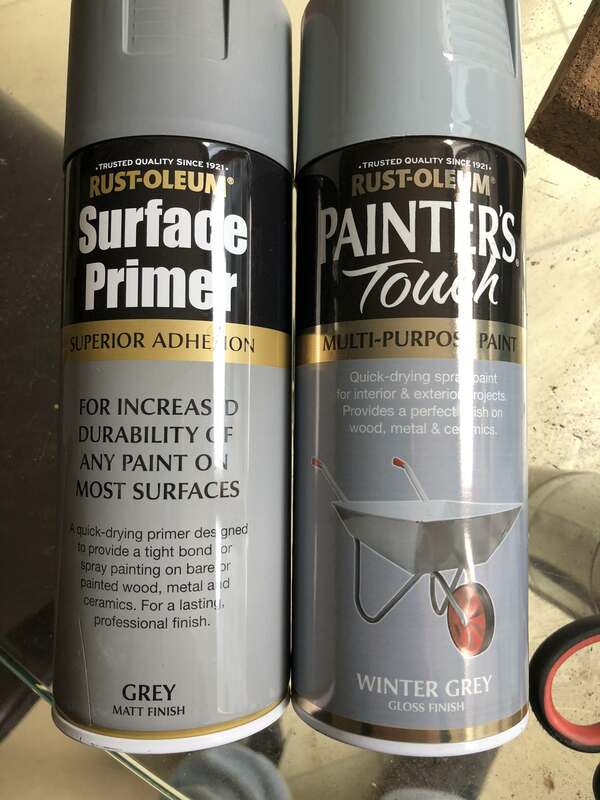 lightly spray rustoleum ultra cover 2x gloss spray with 3-4 light coats 5+ minutes apart--longer if it's a gloss variety (those have more thinner in them and tend to be more runny/dry slower). I'd actually recommend a satin finish instead for much better curing and following with gloss clear afterwards, if gloss is what you want. In high humidity, you will need to wait a good while, maybe even 10 minutes. Best not to paint in high humidity, as paint can turn pretty dull and not cure properly. sand with 2000 grit paper lightly with water--this is only if you also get a rubbing compound, because even 2000-grit sandpaper will leave your painted surface dull. A rubbing compound is a micro-polisher--it will further "sand" the dulled surface to glossy smoothness. You can just use large cotton balls with a rubbing compound and then a polish if desired. 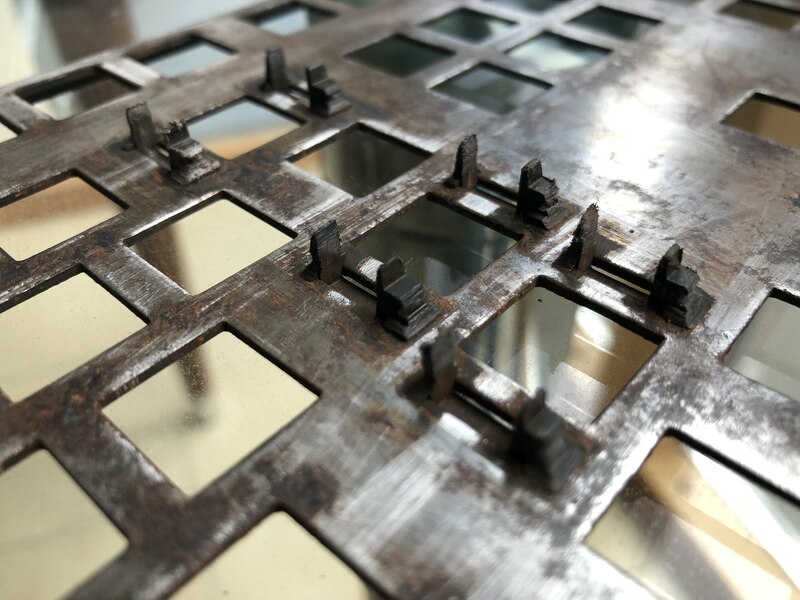 Be careful--it may seem like that wet 2000-grit sandpaper is not doing much, but you can definitely sand through the clear coat in places that are easier to sand. Regarding primers: I really don't know how each particular paint is going to last vs. alternatives. There are significant variations in composition and ingredient proportions between different paint types, and I've had some paint decide to melt off after a couple weeks (one specific metallic paint type and one metallic acrylic paint) and the rest have been holding up very well. One of my computer cases painted with "Aqua" satin Rust-Oleum Painter's Touch 2x was painted over 2 years ago and still looks like new. 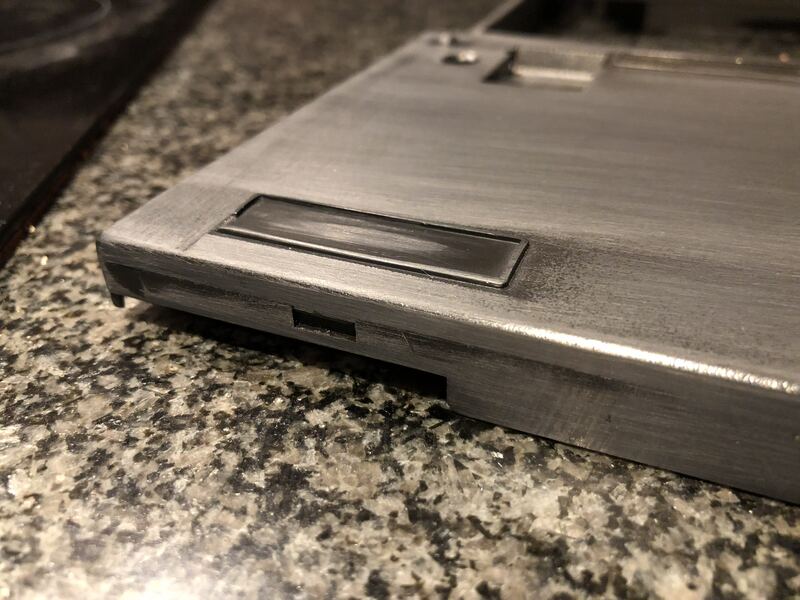 I used Rust-Oleum's plastic primer on the plastic parts, but I'm not sure it was really necessary--and I'm not a big fan of the Plastic Primer--mine goes on kind of flaky, giving some texture. I like the Duplicolor Adhesion Promoter for going on in a fine mist and drying very smoothly. The main issue for a painted plastic case is going to be 1. denting it with random objects hitting it over time and 2. cleaning properly periodically (with something like a soft flannel cloth and no alcohol) and not rubbing it with fingers too much. That's where clear coat seems good--if you have a decent layer, you can later re-sand it lightly and recoat in clear (though I haven't had to do that yet). Just squeeze a small amount onto a cotton ball and rub the painted surface in firm circular motion. You'll see when dull spots will begin to shine. I then use a polish and also have carnauba wax by the same brand. I would not wax until at least a week after painting, since there will still be curing and evaporation happening for quite some time. By the way, the price for all this can really add up. On the plus side, bottles of that size would last you a long long time for small painting jobs. ok. thanks, how does the paint look after just the clear coat and no polishing? can i be finished then? If you use clear gloss, it looks like orange peel when letting light glance along the surface. If looking straight on, it will generally be okay. If you use clear matte, it will look a bit rough and satin-y, not really shiny. A bit like tiny acrylic beads have been misted onto the surface (if putting a matte clear coat over medium to dark colors, you'll get that effect). 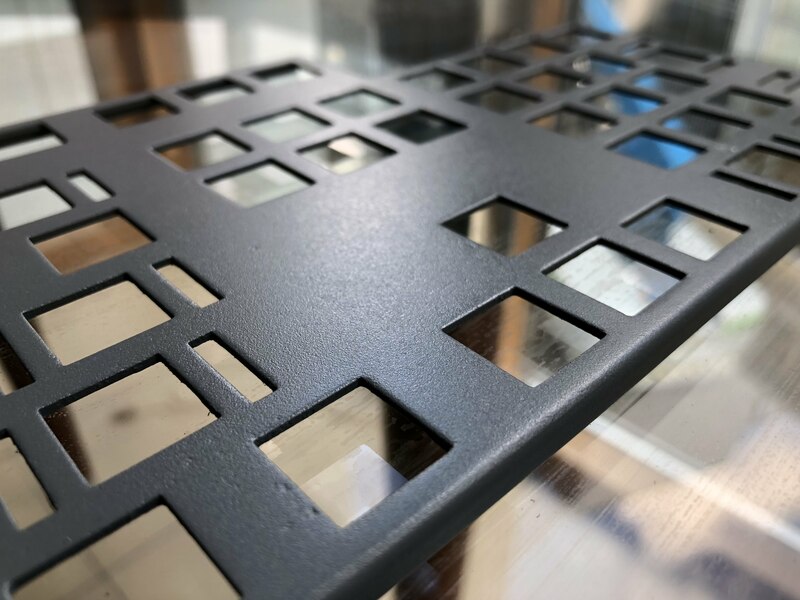 But if you do well polishing a clear coat, it will look like shiny plastic made in the color you've chosen or, if metallic, like shiny reflective metallic surface. 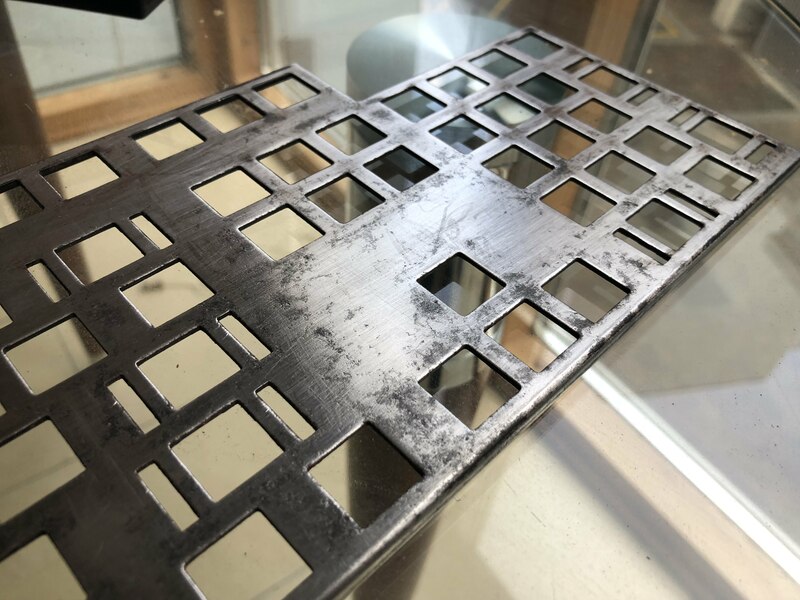 Do you have experience using hammered spray paint? I started with sanding it, primer, then sprayed some Creme White, followed by Red Metallic. Appearantly I should have practiced more, since I got some nasty blots when spraying. After sanding it again (too much, of course) I used the red again, and it came out like this. I guess I'm okay with this! It's been a few days after spraying, and the finish is very hard. 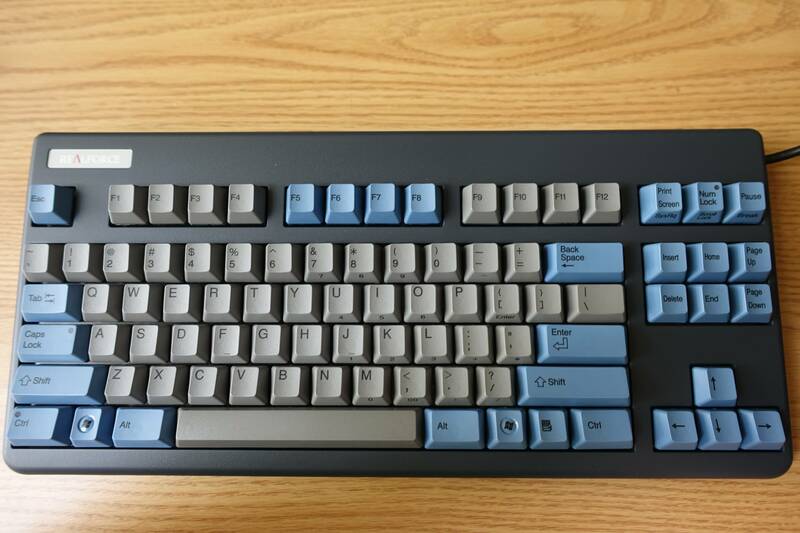 Not sure if anyone is still watching this thread but I find it very useful info in prep for a Filco rebuild that I'm working on. Shown in the first photo: is it possible to remove the clips (not sure what the technical term is) on the metal place that hold the stabilizers? 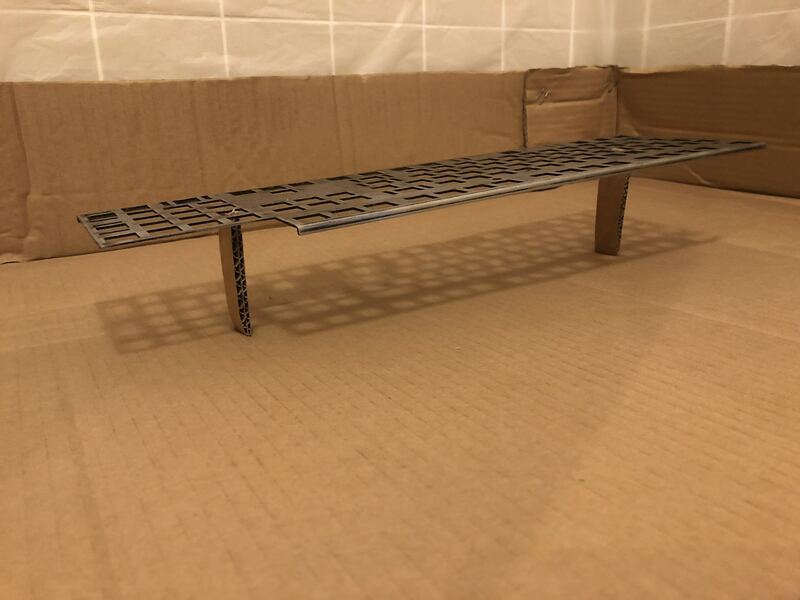 I would like to be able to sand the entire metal frame so can they be removed? If so, what tools do I need and how they they be removed? Is it possible to buy clip replacements? Should I continue sanding until it's completely clean of paint and rust or is this good enough to apply the primer / adhesion coat? Finally I see that you're using adhesion instead of primer on the frame. 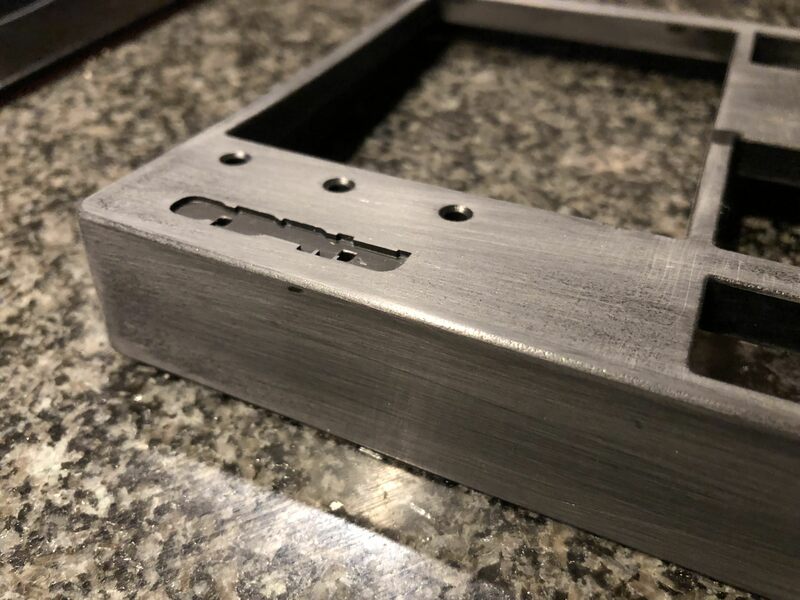 Is surface primer and the "multi-purpose" top coat a good choice to paint the frame? Personally, I *LOVE* Rustoleum's hammered metallic finishes. 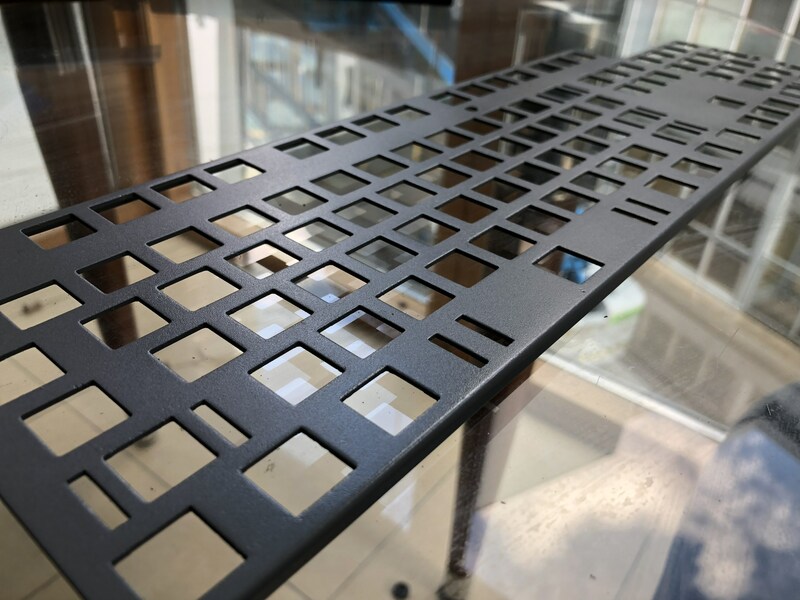 As far as the current question, I am not familiar with your particular plate, but if the plastic tabs can be removed and replaced after painting you will get an infinitely better result. I have broken a number (5%-10%) of various hold-down tabs, so I might do it with trepidation if I didn't have spares, but you should consider it. Thanks. They are costar stabs. I removed them now with pliers. Good luck with the project—looks like a fun one! Those are Costar stabilizer clips you’re talking about? You should be able to remove them by gently squeezing both pointy ends toward each other and pulling one end out of the plate at the same time. The plastic should be flexible. Yes thanks I got it now. How much more sanding do you think I should do? Until it's completely bare metal? Also do you think the primer and top coat selections are okay? We have different products in the US, but those should be fine. Always follow paint directions to the letter, and never try to skimp on drying times. Looks good. Not sure if those dark dots are pitting in the metal (uneven texture) or just old paint remnants. If the former, they will remain noticeable as uneven texture after you paint, so I’d sand more to smooth out. If the latter—not a big deal, you’re ready to paint and can ignore the remaining black powdercoating. Sorry I did not answer your earlier questions. Your specific cans are different from what I’ve used but seem like a fine combination. As the reply before mine recommends: do follow instructions. Don’t overspray! It’s better to do two light even coats than one very wet and runny coat. Allow each layer to dry well before going over it. Make sure to paint at around room temperature or warmer and in low humidity conditions. Thank you. The pitting that you mention is rust indeed however I don't think it's worth continuing to sand any further given that it's cosmetic. I'd be a little wary of creating a slight dent in that area which may affect switch height a fraction. Beyond inhaling unhealthy fumes, you're going to have a cloud of tiny paint particles landing on everything in a radius of 2-3 feet around where you're spraying. You don't want to spray too closely to the surface to reduce this overspray, as then you will lose the ability to do an even coat. I would recommend getting a cardboard box, putting your parts on it, and going somewhere outside where it won't be a big deal to have some paint landing in the vicinity of your box. Also wear clothes and shoes you won't mind getting covered in some tiny paint particles (can easily ruin shiny leather shoes). Used 3 light coats of primer and 2 light coats of top on both sides. Next to carefully prep the plastic cases. Great work! I love your thorough cover-up of the walls with plastic. The plate came out well--the texture probably helps hide surface imperfections. Be sure to allow the paint to dry for at least a couple of days on the plate before handling it much. The paint is dry to touch relatively soon, but it takes a few days or longer to completely harden to its toughest. Can still accidentally make an indent with a fingernail or wrinkle the paint if not being too careful while all the layers of the paint are drying. I'm doing the plastic prep now. It looks from page 3 of this thread that you took the paint off almost completely so I'm going for that. I'm not sure where it starts / finishes on the Filco. It's already well scuffed up and greyish looking but I don't know if there's anything under that or not. Technically there's stuff that can fill in the pitting prior to painting, but it's mostly nasty, such as Bondo (sandable and super hard when it dries, but the fumes are horrible. It works really well with sticking to anything). 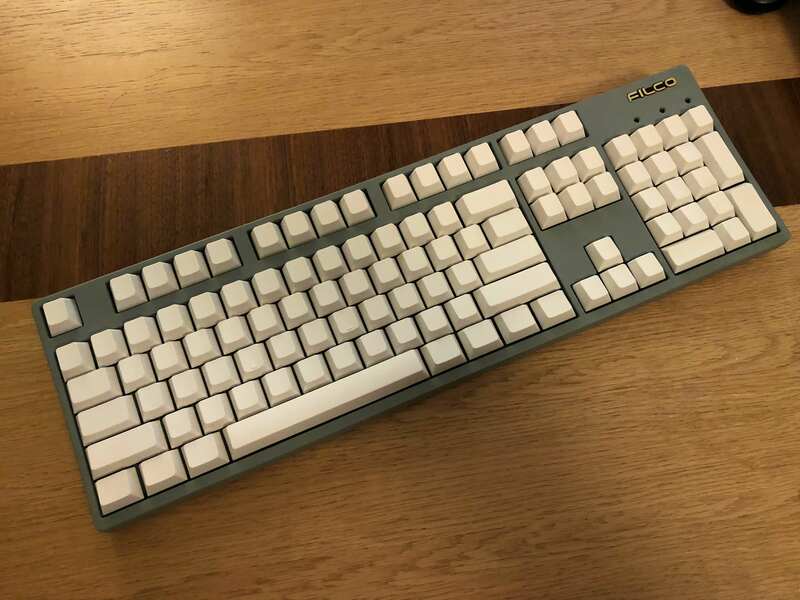 Is your Filco black to begin with? 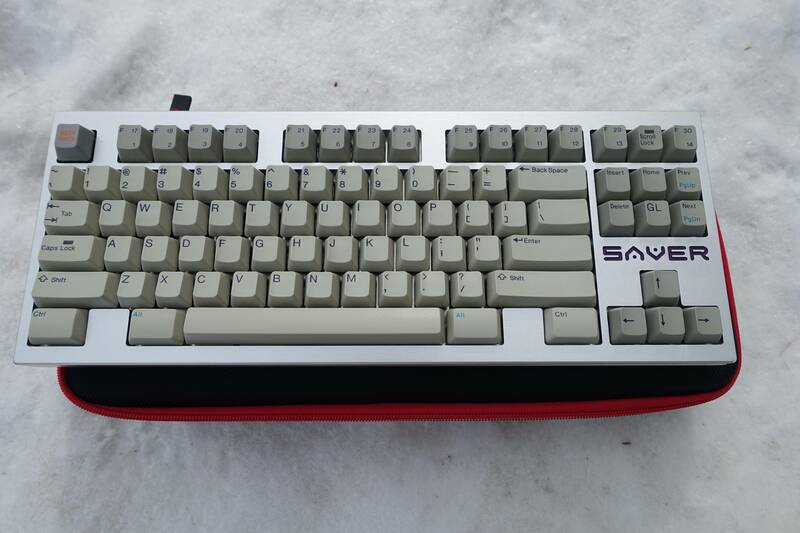 You really don't need to do much to a stock Filco cover if it's black, just maybe sand it a bit to even out the texture. 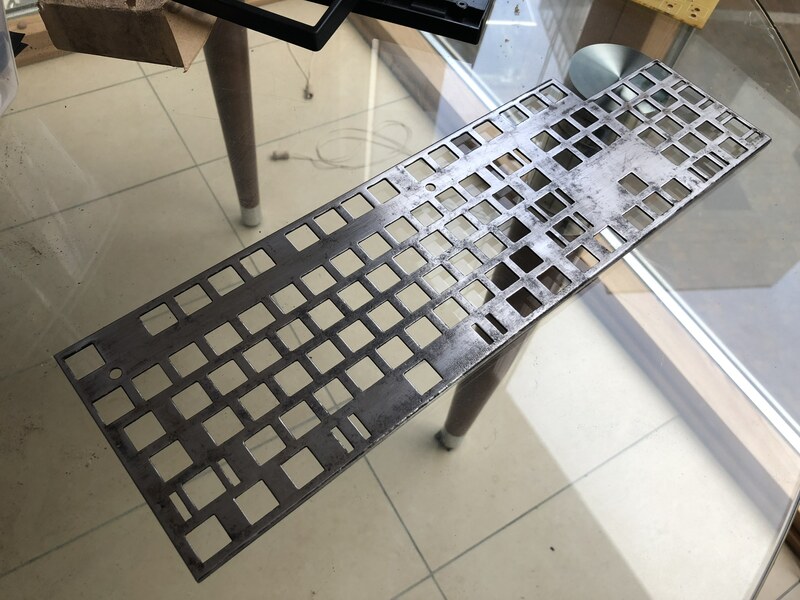 If you like the original texture and don't mind that it will be amplified after spraypainting, sanding is not necessary. If it's one of the painted or printed types like Camo, I would also go over the outer surface with fine grit sandpaper to roughen up the surface a little for better primer adhesion. Wipe the surface with a big cotton ball soaked in alcohol prior to painting to remove any finger oils. 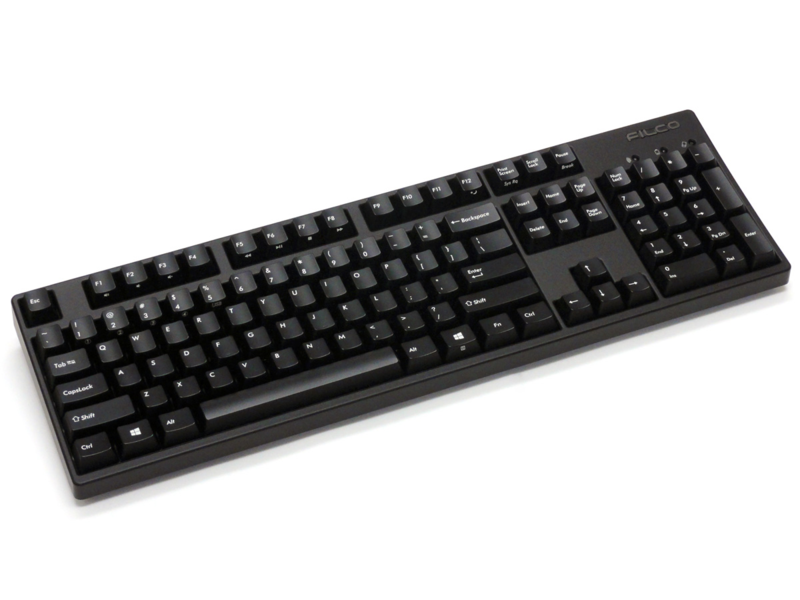 Yeah it's a black Filco. I've already taken it down quite a lot but not as much as your previous jobs. I don't want it to get too thick. I would have guessed that the finish would be better if I take a lot of the paint off? There's no paint on the black Filco, as far as I know--just textured plastic. Other colors might be painted or printed. That's why I said there's no need to sand it, unless you just want to smooth the texture. 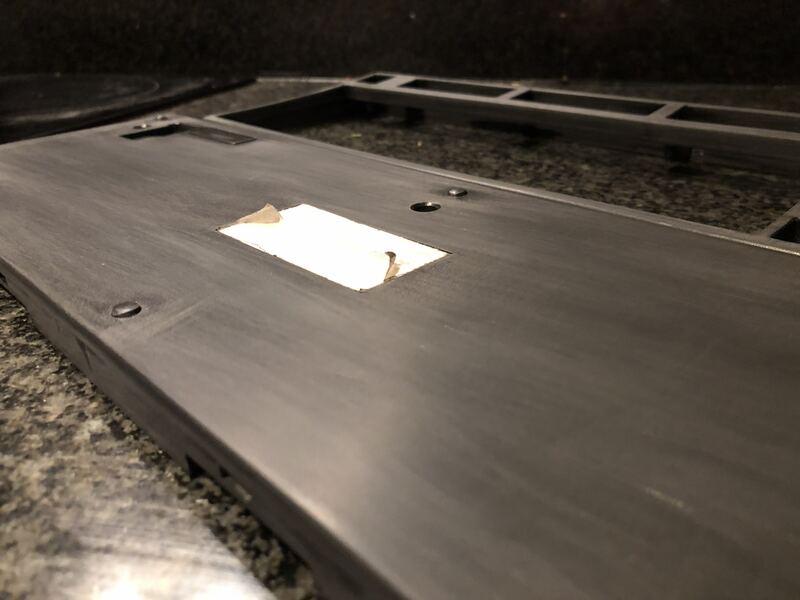 It was CoolerMaster QFR tops that you saw sanded in earlier posts--those have "soft touch" rubberized coating on the old gunmetal silver covers, for example. Are you sure? I would be surprised if it didn't have some kind of clear sealant at least. I'm pretty sure, yeah. Just textured plastic if it's black to begin with. I mean I haven't looked at the newest Filcos, but the ones I have had a few years ago that were black did not require any sanding. You can fold sandpaper around an edge of a credit card or tip of a sharp stick, or roll it into a narrow cone shape. Fortunately tiny spaces are less important. 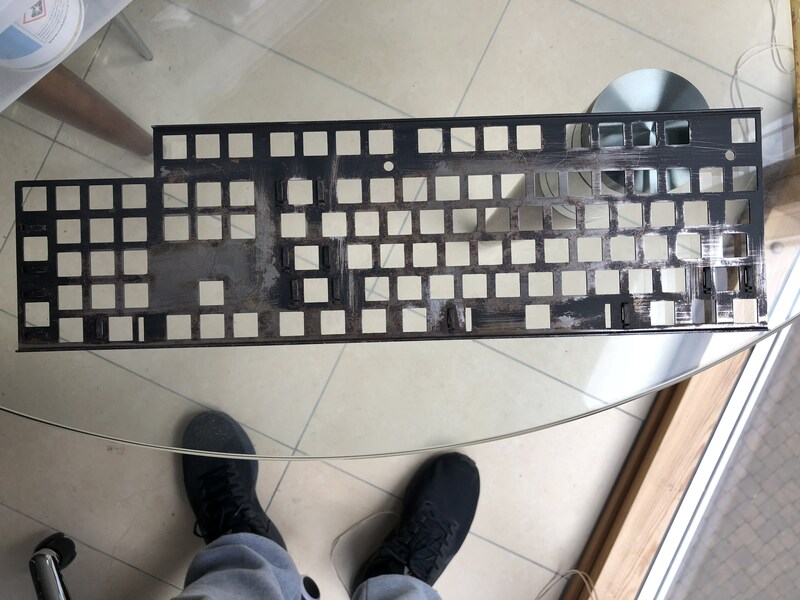 Definitely advise against sanding inside the Filco logo if you want to preserve the neat shape of the opening (just don't overspray the paint into it, and the original logo should still fit back into the opening). I still think your sanding of the black top is futile. Okay thank you. I will give it a light sanding so that the primer bonds properly to the plastic and leave it at that. Finished case prep. Used 180-2000. Removed the feet by pushing hard on one side and lifting up. I'm not intending to paint the inside of the rubber grip holders. 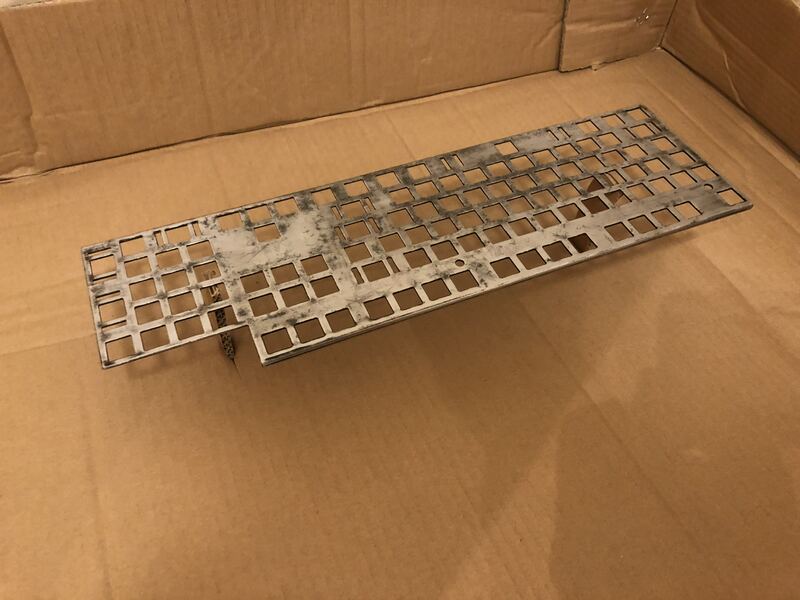 On a side note, does anyone know where I could find replacement Filco rubber grips that stick to the underside of the case? I kept the old ones but I'm not sure how easily they are going to stick. I've applied the primer using thin coats which is going well. Even though I sanded the case with 2000 smooth, the primer texture is quite rough. Wondering if I should sand it with 2000 before applying the top coats? the primer texture is quite rough. Not sure what "quite rough" means but primer is intended as a undercoat that the top coat adheres to, therefore, it shouldn't be glossy smooth anyway. You shouldn't sand the primer--you can sand the paint after you're done painting, after a few well dried top coats. Textured finish is inevitable with canned spray paint. This is another reason I like the Duplicolor Adhesion Promoter as primer--it goes on in a super fine mist and doesn't really add much visible texture. Thank you. Between the primer and the top coat. How long should I wait? Also between the top coat and final sanding, how long should I wait? Strongly depends on the paint itself and your painting conditions. In my experience gloss paints have more thinner in them or else formulated in such a way as to stay runnier for longer. They take longer to dry vs. matte paints. Also if you paint in warm or humid conditions, it takes longer too. I would say that between the primer and top coat, you can just wait an hour or two (follow instructions on the can). With the primer I mentioned that I like, I only wait about 10 minutes, as it goes on super fine and dries really fast. 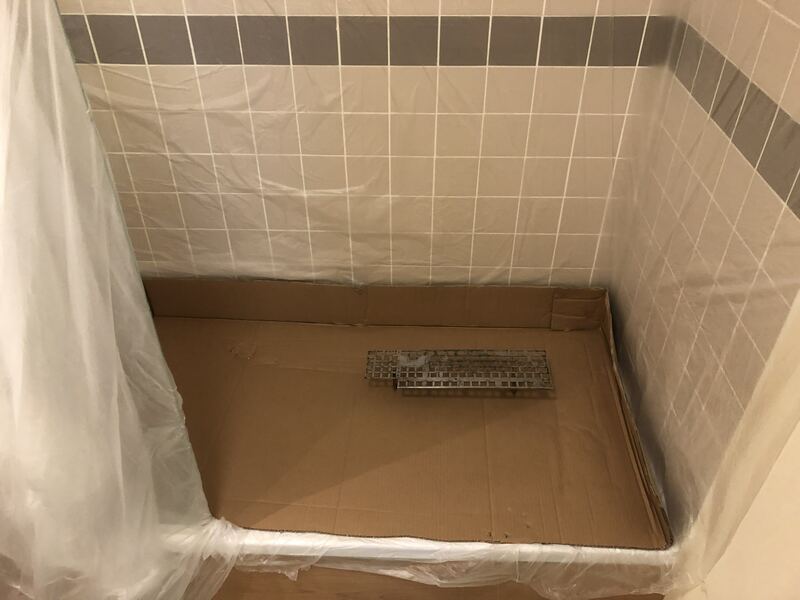 As for waiting between paint coats, as long as you're doing them in very fine even layers, you can just wait about 10-15 minutes before doing the next coat, for something like 3-4 fine coats. I would wait a full day for the top clear coat. I would wait 2 days to begin sanding and polishing--test on a small, less conspicuous area. 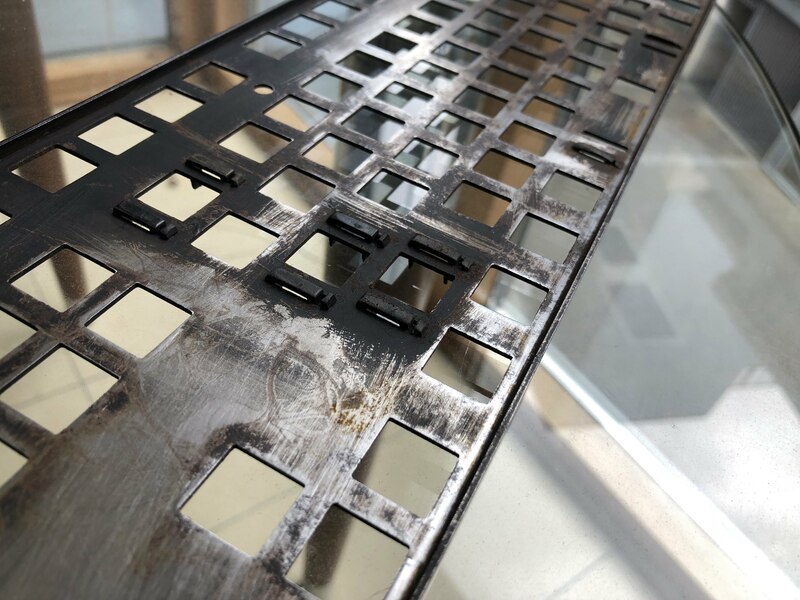 If you intend to do a lot of surface smoothing from orange peel texture to glass smoothness, definitely do 2-3 layers of clear coat so that you don't sand through it when doing the final fine-grit wet sanding. Once I used a white pearl paint over white base paint, and the pearl layers were still soft to fingernail dent test 3 days after painting. Thankfully the surface hardened properly after a full week of curing. EXACTLY AS LONG AS THE INSTRUCTIONS SAY, OR LONGER. Thank you. In this case, I think I'm ready to apply the top coats. It's been around 2 days. After this, I'll leave the top coats dry for one week before considering sanding for safety's sake. Quite a transformation--thanks for sharing! I always love the refurbishment stories of well-loved items getting a second chance. Those old switches looked super bad. Hopefully the PCB didn't suffer much from all that surrounding corrosion. I like the new industrial color look Take care with cleaning the case to avoid using any harsh chemicals.